The Beer Can House is Selling My Book … How Apropos! I have a long-standing relationship with beer. Okay, that didn’t come out right. I mean, I enjoy an occasional beer, but that’s not the point. The point is that autographed copies of my new book, Arthur Zarr’s Amazing Art Car, are available for purchase at the Beer Can House in Houston, Texas. If you don’t know about this delightful and iconic Houston site, you’re in for a treat. First, though, let’s get back to my relationship with beer. 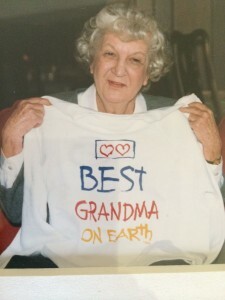 Margy Mae Stephenson Stamps was my darling grandmother, and her eight grandchildren called her “Ma.” Born July 25, 1915, I remember how Ma liked to brag about her Leo zodiac sign. And the Leo description fit her to a tee: “Charismatic and positive-thinking, they attract not only an abundance of friends and opportunities, but manage to survive life’s stormy times with style and good humor.” Ma had a playfulness about her, despite having experienced her share of hardship. She told us stories of going through the Great Depression, and of taking care of her two younger brothers when her mother fell ill. I also knew she had tragically lost her husband—my grandfather, Dobie Stamps—when she was just 48 years old. But you wouldn’t have known it, because she remained witty, spirited, hard working, loyal, and loving until she passed away in 1994 when I was age 31. Ma liked her beer. Schlitz beer. My parents didn’t drink, and, growing up, we never had much, if any, alcohol in our home. So, as a child, it tantalized me that my petite, respectable grandmother drank a beer each day. How fantastically scandalous, I thought! Her affinity for a can of beer, coupled with her trendy style (think fashionable jeans instead of shapeless “grandmotherly” dresses), made her the coolest granny ever, in my eyes. In my youth, I wrote and illustrated hand-made books at a prolific rate. My heroine, Ma, was often the front-and-center theme of my childhood creations. This photograph is one of many silly examples in which I demonstrated Ma’s cool-factor in the form of literature and art (written by me at about age 8 or 9). Ma would have been 100 this year, and I find it fitting that my children’s book is being sold at the Beer Can House gift shop. Does that sound like an odd location to sell a children’s book? Well, it’s not! 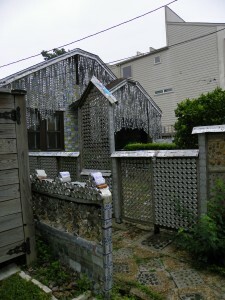 The Beer Can House is a beloved Houston attraction that draws thousands of children and adults each year. John Milkovisch, a retired upholsterer for the Southern Pacific Railroad, started his project in 1968 when he began inlaying thousands of marbles, rocks, and metal pieces into concrete and redwood to form unique landscaping features. Next, Milkovisch began to add flattened aluminum beer cans to the sides of the house itself—a process that he perfected over the next 18-plus years. I’ve read that Ripley’s Believe It or Not! estimates that over 50,000 cans adorn this must-see monument to recycling. 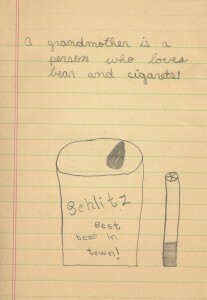 Will, age 9, at Beer Can House. 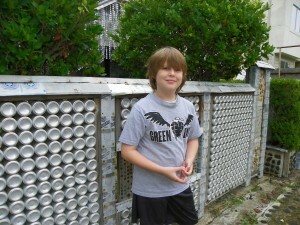 In 2009, six years before I wrote or even thought of the idea for Arthur Zarr’s Amazing Art Car, I took my youngest son Will—who was then age 9—to visit the Beer Can House. I wanted him to learn about outsider art, and this was one of our many stops throughout Houston on what I dubbed our “art crawl.” I can’t remember if we saw any Schlitz cans nailed to the house, but it is reported that Milkovisch said his favorite beer was “whatever’s on special.” That sounds like something Ma would say, too. If she were still alive, I know she would get such a kick out of seeing my book on sale at the Beer Can House. Are you still wondering why my picture book is being sold at the Beer Can House, of all places? Well, the restoration of this home is an ongoing project of the The Orange Show Center for Visionary Art—the same organization that hosts the annual ART CAR PARADE. So, that’s the connection! The Beer Can House is open most Saturdays and Sundays from 12-5 p.m. and is located at 222 Malone Street in Houston. Admission is only five dollars, and kids 12 and under are free; and the fun memories of your visit are also free! While you’re at it, perhaps you’ll buy a copy of Arthur Zarr’s Amazing Art Car. Your purchase there will support the endeavors of the Orange Show Center for Visionary Art, which is a 501(c)3 publicly funded non-profit organization. Note: Arthur Zarr’s Amazing Art Car is also available for sale at The Orange Show’s main office, located at 2402 Munger, Houston, Texas. Check with them for hours of operation.